Because Steven is the type of person who inspires the best in people, I fought to keep expletives out of my affirmative reply (and miraculously succeeded). The ticket to the night’s event. Monday arrived with its usual haste and brought a steady, day-long drizzle. A gray afternoon shifted to a gray evening and soon, we found ourselves scarfing down McDonald’s burgers and barreling down a rainy highway to a university I didn’t know existed before this day (University of Science and Arts of Oklahoma, bless you for making admission to this event free of charge). The venue was small (intimate was the adjective I offered), but we didn’t mind, as every seat would give us a good view of The Author. When @neilhimself took the stage, we applauded (part of my applause was for myself, as I correctly guessed that he’d be wearing all black). He kicked off the evening with a few thoughts on writing, with the aim of de-mythologizing the writing process. Writer’s block, he asserted, is a convenient thing writers use to shift their ability to solve their own problems elsewhere. “Gardeners don’t get gardener’s block,” he pointed out. He then read a few of his short stories—wonderful tales of frustrated genies and igloos made of books. This night helped me remember that there’s something special about hearing an author read his or her own work aloud (the accent was certainly a plus as well). Then, he graciously turned to the stack of questions that had been collected from the audience before he’d begun his talk. The one that elicited the best advice of the night was something along the lines of “What pitfalls/missteps have you experienced in your career that aspiring writers ought to avoid?” He responded with a story about a book he wrote on commission at the age of 23. The book wasn’t about anything he was particularly interested in, but the pay was good, so he wrote it anyway. When it got published, it was a success, and a good amount of royalties was coming his way. But then, the publishing abruptly company folded, leaving him with nothing at all. Well said, sir. And thanks for a wonderful Monday evening. Mr. Gaiman does delightful impersonations of Steven Moffat and Terry Pratchett. This entry was posted in Books, Random! and tagged neil gaiman, usao, writing. Bookmark the permalink. 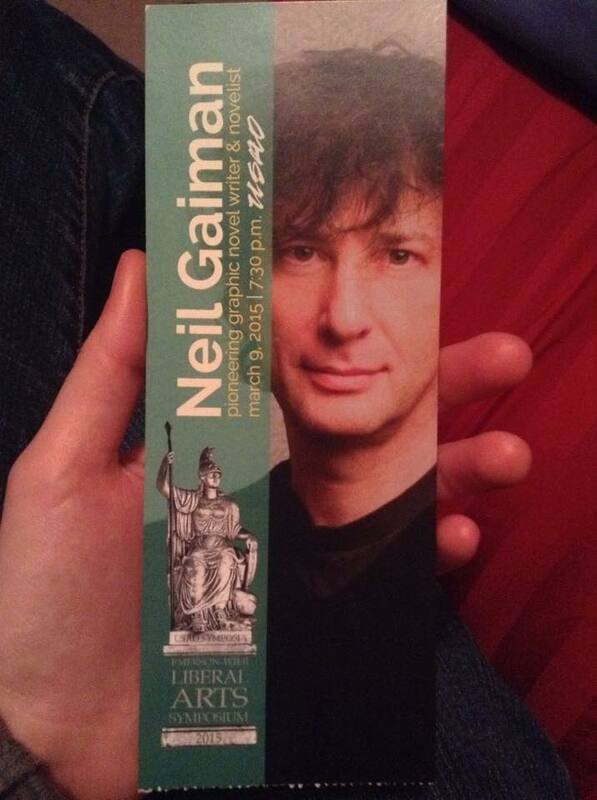 3 Responses to So I got to see Neil Gaiman. That was perhaps my favorite quote of the night!